My life is full. Full of things to do. Activities I’m passionate about, writing that brings me joy, work that is fun and purposeful, people I want to know better and spend time with, chores and errands and work to create the home I want to live in. It’s full, my life. 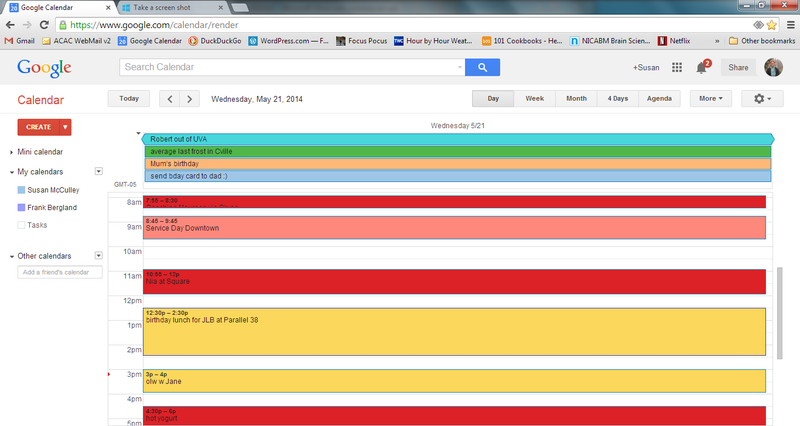 My calendar is color-coded with mostly no white spaces. I’m busy. Often, I’m rushing. My husband marvels at this. He wonders why, since I am in charge of much of my own time (the gift and the curse of the self-employed), I manage to be running around so much. I toss my hair at this: I’m passionate! I’m joyful! I’m fun, dammit. So hush up about it. 1. Happy people are grateful. 2. Happy people are generous and help others. I’m poised over this like a little Happiness Scorecard, holding tight to one of those little half pencils from mini golf. 2. Help others? Do my best to. Check. 3. Savor? Um. Well. Sometimes. I do … a little … savoring. Here I drop my little pencil and put my head on the table since he knows as well as I do that I don’t savor. I don’t let chocolate meditatively melt in my mouth, I chew it. I don’t sip tea, I gobble it. And mostly I ride my bike to yoga because it’s faster than driving. It’s true. I rarely choose to savor. There are just so many cool things that I want to DO and I don’t want to miss out on DOING any of them so I rush from one to the next. But here’s the rub: by rushing, I’m actually missing out on those cool things. My addiction to the rush of rushing, to the feeling that I’m important, and that I have a passionate, purposeful life is getting in the way of me actually feeling my passionate and purposeful life. It is a habit for me to hurry, to over schedule, to squeeze as much as I can into a day. Even if I’m meditating regularly. It doesn’t matter that I’m mindful whilst I zip about. Even if I’m paying attention and aware, rushing often squashes the life out of my time. I know why I’m addicted to rushing and I feels like a good idea to make a different choice. I stand before you — a rushin’ refugee. Savoring is worth doing. As I wrote about last year, mindful savoring makes memories. The more we are deeply attentive to what is happening, the more likely it is that we will remember our experiences, that we will remember our life. So I’m pledging to savor: to put my fork down between bites, to listen to music without doing something else at the same time, to let the chocolate melt on my tongue. I expect this may be a challenge for me, but rushing is a habit I want to break, so I’m doing what every over-scheduling over-achiever would do: I’m naming June 2014 Savoring Month. On Wednesdays in June, I will report in a comment on this post and on the Focus Pocus Facebook page about how I’m doing with savoring. In particular, I will focus on eating (fork down, chew, swallow breathe, relax), drinking (sip and breathe, sip and breathe, even after yoga), and driving (leave extra time to get there without the adrenaline rush). I’ll let you know how it’s going. And if you’re a rushin’ refugee and you’d like to come along for the (leisurely) ride, I’d love to hear how it’s going for you.